Since 2002, JSI has been applying training expertise to emergency preparedness, working at the local-to-national levels in the US and other countries to build response capacity. JSI has developed training and exercise programs that address emergency preparedness topics, including community preparedness, continuity of operations planning, emergency operations coordination, emergency public information and warning, and epidemiological investigation. JSI brings together training development teams that include experts in the fields of emergency preparedness, instructional design, and web design to develop training programs that are engaging and achieve stated goals. 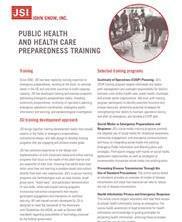 Highlighted training programs include: Continuity of Operations (COOP) Planning, Social Media in Emergency Preparedness and Response, Preventing Disease Transmission Through the Use of Standard Precautions, and Health Information Privacy and Emergency Response. JSI, 2018.